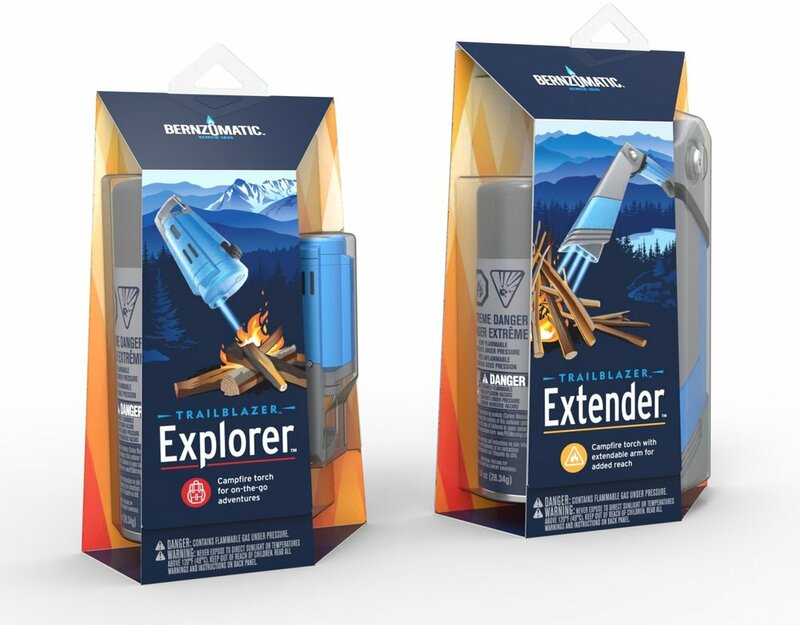 Swerve created a new brand identity and packaging for the Bernzomatic Trailblazer line of torches by focusing on the magic of the campfire experience and our place in the great outdoors. As part of the city’s drive to improve the appearance of the streets and meet goals for recycling, New York City has launched an initiative to replace all trash cans and bins across the 5 boroughs. Swerve were honored to design three options, all use recycled materials and greatly improve the ease of use and emptying. Another feature of our designs are that the appearance and longevity of the bins are improved by the use of replaceable parts in key areas of wear, as an efficient serviceable unit. For the Arccos Grips product, Caddie, we created a new format of physical packaging. Each package opens to reveal two layers of sensor embedded grips, along with a guide booklet and putter sensor. Care was taken to create a strong physical connection with the prior sensor pack, through materials, opening features and the slide on printed sleeve. This helps create a strong brand dna and allows the messaging to concentrate more on communicating the product features and benefits. 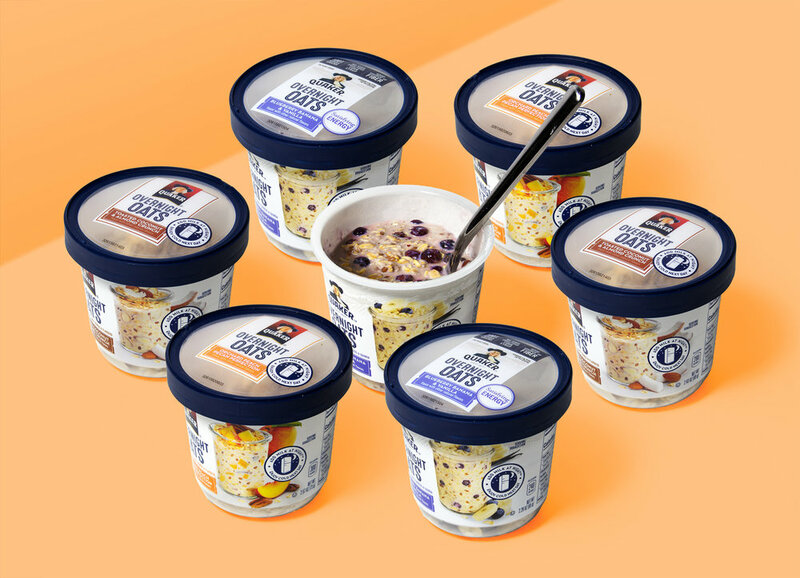 We are delighted to have worked with the Quaker team, helping to design and develop the physical packaging for the Overnight Oats line of products. Throughout the process care was taken to create a form that both presents the product at shelf and also provides a practical container for preparing and eating the oats. Exec Connect incorporates a set of USB connectors and also a wireless charging pad, combined with a digital alarm clock/calendar and a number of interchangeable storage caddies. The linear design of the unit takes inspiration form mid-century architecture and the combined use of solid forms, framing, and transparency to create a sense of lightness and visual focus. Swerve have expanded the line of Visual Charge wireless charging pads by designing a second triple device pad. This product features a slick reflective surface with a perfectly tactile central pad area to keep the devices in place, along with a multi color charge indicator light which glows behind the charge area to subtly show the status go the devices battery. Swerve designed a new structural package for this family of phone brands. A fully paperboard package with a suite of modular internal trays to accommodate a wide range of smart-phones and accessories from different manufacturers with an outer sleeve carrying the brand and plan info. 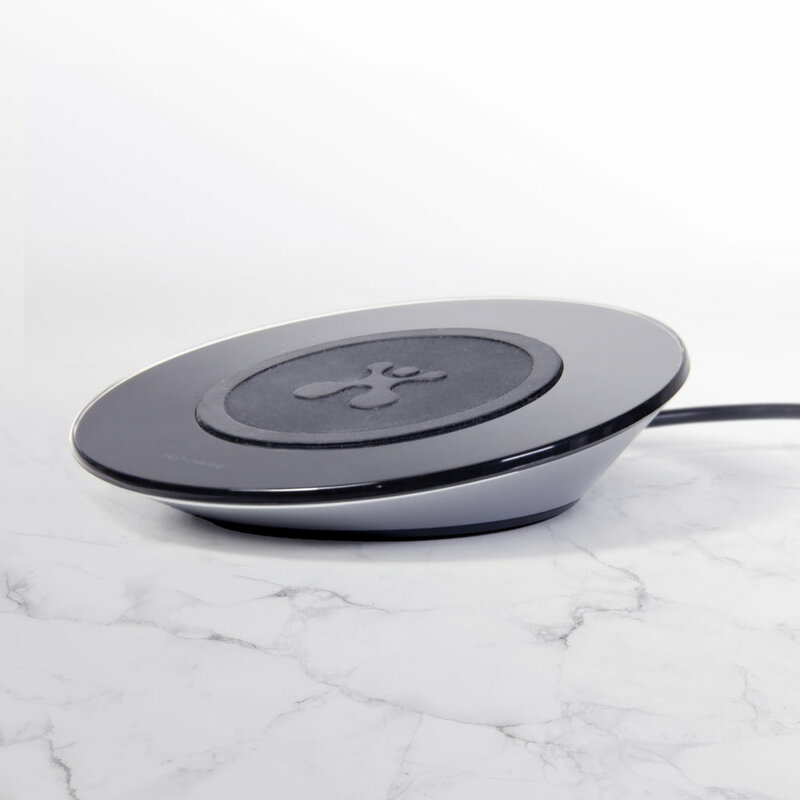 Simple and intuitive - Our design for this wireless charging pad was centered around being easy to use and easy to understand. A clean, backlit surface glows when charging, combined with a rubberized pad to hold your device in place on a slightly inclined surface. Engineered to the highest level and visually clean, available online and in retail across the US. 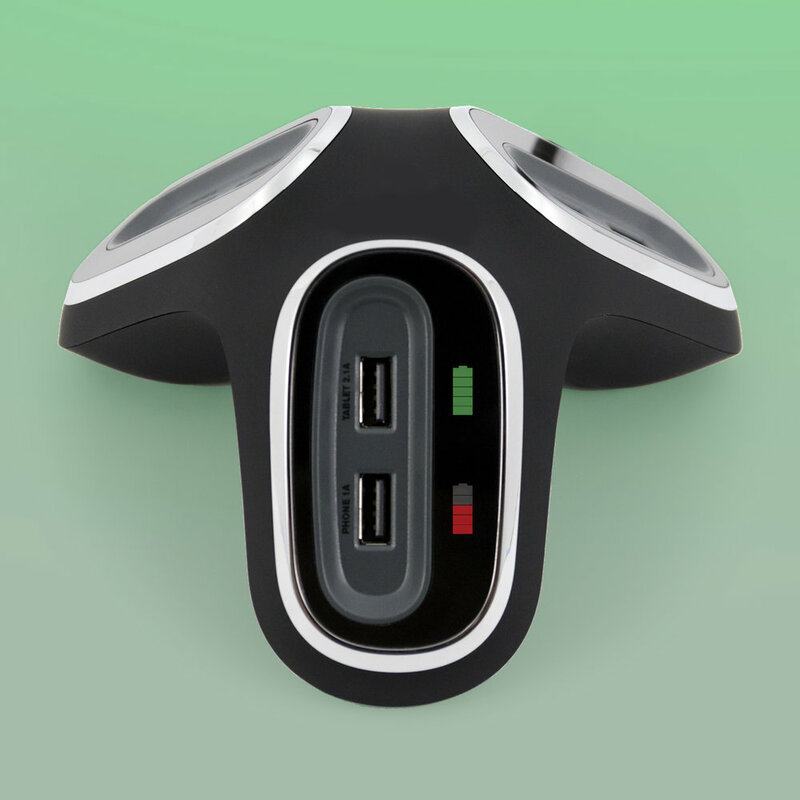 Swerve created this 6 USB port charger to provide fast and efficient power in the home and at work. The charger has three angled faces which reduces the footprint and also incorporates the smart visual charge indicators to show the state of the charge without powering up the device. On sale now across the US under the Sharper Image brand, we are excited to play a part in elevating this everyday task and are already at work on the next wave of breakthrough power products. Swerve is very proud to have once again received Graphic Design USA's packaging award, this time for our work on Martin's Handmade Pretzels packaging and branding. It has been an honor to work with this eighty year old brand, a beloved New York institution, and we look forward to their continued success as they bring these delicious snacks to national retail and speciality food stores. Integrated Design: A Powerful Equation in Packaging. Brand Packaging magazine article by Swerve. The article explores the advantages and pitfalls of holistic graphic and 3d packaging design and development, and includes a checklist of keys to successful integrated programs and critical components in bringing groundbreaking holistic designs to market. For the retail launch of Duop cleaning system Swerve created both branding and packaging graphics - a suite of logos, imagery and copy within an adaptable palette of color blocks. The packaging lifts the Duop line above the established competition by building a confident and strong messaging system, informing the consumer of the products advantages along with the more aspirational results based images. Swerves latest design for the Quirky brand is a six socket usb charger with built in cable management and charge indicators. The hexagonal form and elastomeric finish create a unique aesthetic and also allows for the cable coverings to be integrated into the surface without the need for expensive and breakable hinges. Each cable pocket allows the user to charge multiple devices independently while keeping surfaces tidy and cable free. Swerve designed and engineered the unit for fast and efficient production with minimal assembly and finishing. Launched this month is a new set of portable speakers designed by Swerve - the Sonick Plus. These bluetooth devices are designed to provide the best sound along with an easy to use set of controls and a charging base which includes additional USB ports. The end cones feature a solid rim allowing the units to stand upright or be laid on their side and are available in black and white. New packaging, designed by Swerve, for the ground-breaking Arccos golf sensor is launched. The packaging format creates a delightful reveal and protects both the single driver product and the full set in angled articulating packages. 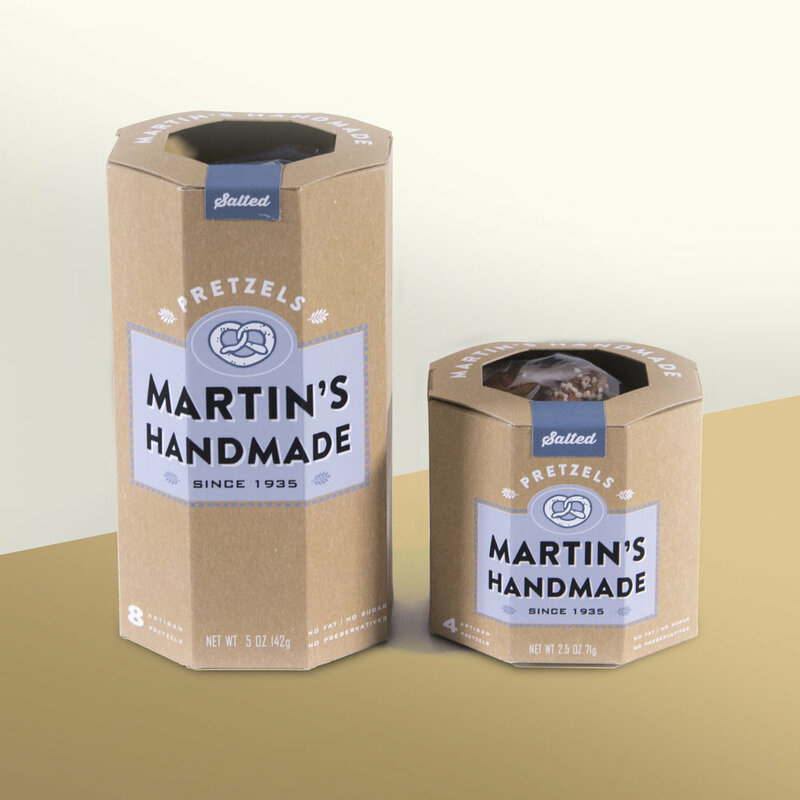 Swerve is excited to see the roll out of the new branding and packaging created for Martin's Handmade Pretzels. First launched at the international food show in Chicago last year, the packages have been securing new orders and providing Martin's with a means to move from the marketplace to in-store retail. It has been a wonderful experience to bring about this transition and play a part in the continued success of such a delicious product. New packaging, designed by Swerve, for the much anticipated Spyder5 screen calibration tool is launched. The new compact product is presented in an entirely paperboard construction, with significant size reduction and cost saving. Swerve's design of a unique and patented child-resistant single dose pouch for Pediacare wins Gold award for packaging innovation at the NJ Packaging executives club. Article on the redesign of Tweezerman Studio packaging by Swerve, "Case in point". The article was first published in the March 2013 edition of Brand Packaging Magazine.